Description: Vine with slender stems, yellowish orange. Habitat This parasitic plant can be found on a variety of plants in coastal areas, commonly in sandy soil between 0–300 m on most islands (Wagner et al. 1990:583). Medicines: The kauna‘oa is combined with moa holokula, moa lelo (?Psilotum nudum), and kī leaf buds (Cordyline fruticosa), ingested to induce vomitting to rid thick phlegm (chest cold) from the stomach. In addition, a liquid concoction is made of kaukao‘a lelo and water and administered to women after childbirth to discharge the placenta and remove accumulated blood (Chun 1994:140–141). Mele: "Lei ana i ka pua o ke kauna‘oa" line in "Lāni‘i" (Elbert & Mahoe 1970:73). 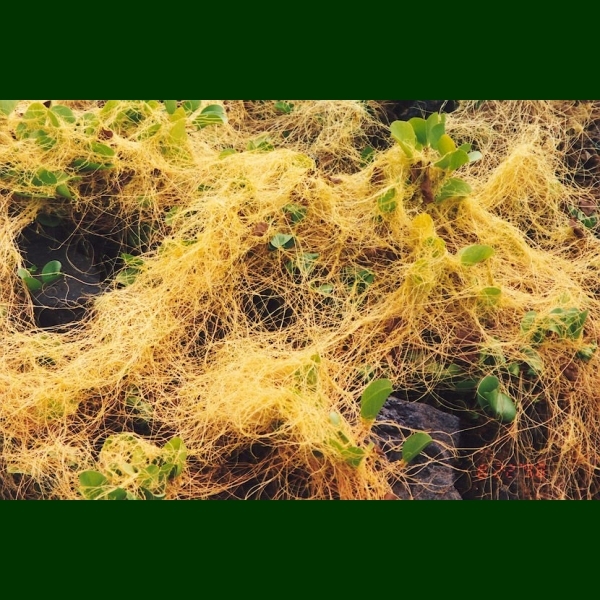 Propagation Information: Because this is a parasitic plant you can take cuttings of it and wrap it around weeds/other undesirable plants (Bornhorst 1996:49–50). 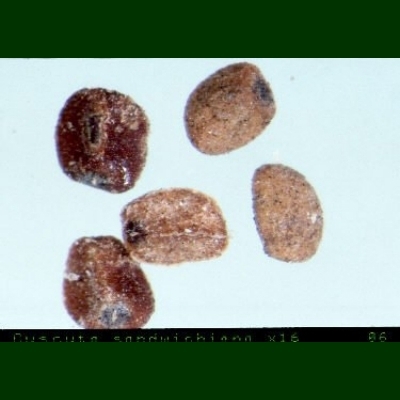 Seed: Seed length approximately 1.5 mm. Photograph: B.Kennedy.